When I was a financial journalist, I had the unparalleled chance for many years to talk with traders and financiers. What is one thing that stands out from those times calling around to my Wall Street contacts? The best of them know how to envision a potential investment trend from what appears, to ordinary mortals, as a series of separate events. That’s what I see happening right now in the emerging-markets sector. We have a parade of events about to happen. Put them all together and we have the makings for a real “turning of the tide” for emerging-market stocks. As I noted late last year, emerging markets as a group are getting stronger, outperforming U.S. market indexes. Since the S&P 500 Index bottomed the day after Christmas, it’s up 8%. Meanwhile, the iShares MSCI Emerging Markets Index (NYSE: EEM) rose 12%. Likewise, since mid-October, when the S&P 500 started to break down, the index is down 6%. But the emerging-markets exchange-traded fund is in positive territory, up more than 3%. The first of the parade of events destined to make the emerging-markets rally even stronger in coming months? Resolution of the EU’s Brexit problem. I’m betting the whole thing gets canceled — no Brexit. Here’s the thing: Markets hate uncertainty. And for two years, Brexit’s been the biggest uncertainty out there. Britain’s departure deadline is March 29. EU court decisions leave the option to cancel Brexit open without penalty. In December JPMorgan Chases’ economists raised the chances of “no Brexit” to 40%. And that was before Parliament’s recent no-confidence vote on Prime Minister Theresa May’s leadership. She narrowly survived. But it demonstrates the steadily weakening support for Brexit. The second is the U.S.-China trade standoff. U.S. Trade Representative Robert Lighthizer and his Chinese counterpart meet for high-level talks later this week. A resolution of those difficulties would have immediate bullish impacts on the global economy. But the trade impasse has also pushed China’s central bank to inject large amounts of stimulus back into the economy. On a single day in mid-January, it injected a reported $83 billion into the banking system. It takes time for stimulus to find its way into an economy the size of China’s. But as it does, it greases a long runway of support for stocks not just in China, but in many other emerging economies as well. The third is the Federal Reserve’s increasingly dovish spin on interest rates. We’ll know more when the Fed’s policy committee finishes its latest meeting on Wednesday, of course. He’s “very worried” about growing indebtedness (which higher rates only make worse) — enough that he’s willing to put the Fed on the sidelines for an extended length of time. If there’s any one single factor that’s kept emerging-market stocks underperforming in recent years, it’s the impact of the Fed’s rate hikes on the U.S. dollar. Higher rates make the dollar more attractive against other currencies (where foreign central banks were, in many cases, still cutting rates). As the Fed moves to the sidelines, global investors will have to make a choice. Keep pouring money into a fully valued (or overvalued, depending on your view) U.S. stock market at peak economic strength? Or start directing funds into other markets, where there’s plenty of growth and clear undervaluation? As I noted late last year, the U.S. has a cyclically adjusted price-to-earnings ratio (CAPE) of nearly 30. India, with gross domestic product growth of 7% — twice that of the U.S. — has a CAPE ratio of 21. Another fast-growing emerging market, the Philippines, has a CAPE of 18. It’s followed closely by Mexico, and even Europe’s industrial powerhouse, Germany. The point, then and now, is that staying fully invested in the U.S. gets harder from here. 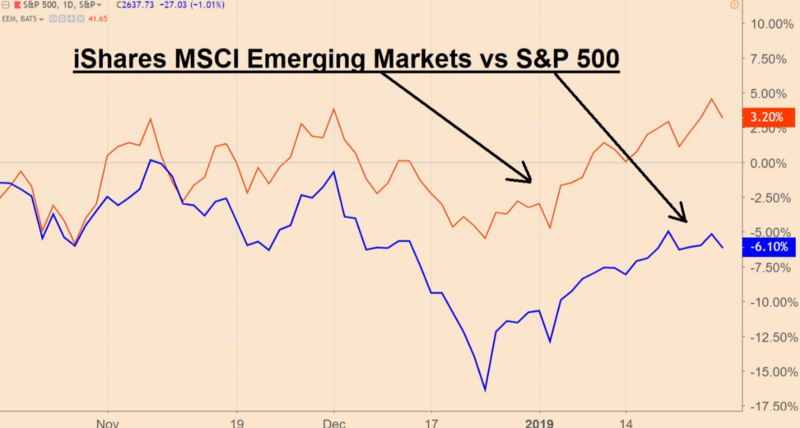 On the other hand, the case for investing in emerging-markets stocks like the iShares MSCI Emerging Markets Index (NYSE: EEM) couldn’t be more compelling. Of such comparisons are huge rallies made.